I am getting married to the most wonderful man in the world. Seriously. I am not lying. I know I'm biased, but it's true! Michael proposed last Sunday at sunrise, and I said oui, si, of course, yes, hands down, no doubt, YES! Actually, I just said yes, but inside it was all of those things. Here I am smirking at the camera. Not sure why. 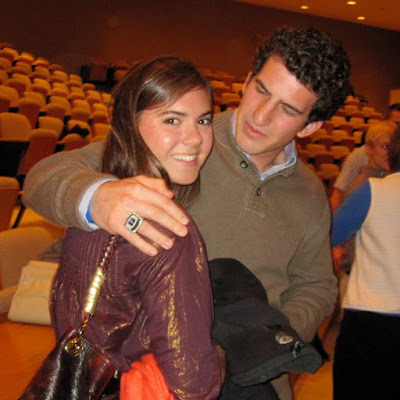 But this was at Michael's ring ceremony for his team winning the 2010 lacrosse national championship. Two words: Stud muffin. Michael received that blingin ring that you can see on his finger -- little did I know that I'd be getting a beautiful ring myself a few months later. Mmmm I reread what I just wrote. Sounds like total CHEESE. Oh well. 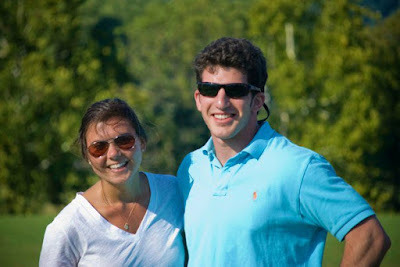 Let me tell you what -- Sarah and Steve Schoeffel did an amazing job helping Michael plan and set up the proposal. They are true and faithful friends, and I am so grateful for them for so many reasons! Abigail also gets big props because she did a fantastic job making me beleive that Michael wasn't going to propose for at least another week or two. And this was Abs! My sweet friend who flips out about love. Both Michael's and my parents came in for the proposal -- another sweet treat of the day. I feel like it is my duty to comment on your post to remind you that people "stalk" it. YEEHHAWWWW!!!! I just love dreaming of you as Keira Knightly in Pride and Prejudice mixed with Reese Witherspoon in "Sweet Home Alabama"
Molly just told me the news! I couldn't be more excited for you. Lucky man!!! I'm so happy for you, CB! And glad the big news finally made the blog. You will figure the whole wedding planning thing out one way or another and the honeymoon will be well worth the wait! !